This page holds everything that couldn't fill its own page, including models, code, and documents.. 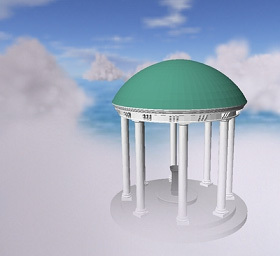 The Old Well is the visual symbol of the University of North Carolina at Chapel Hill. Click on the image to the left to download oldwell.zip, which contains 3D Studio (.3ds) and 3D Studio MAX (.max) models of The Old Well. I obtained these models from Ben Lok, who was part of a team that modeled it for a class project several years ago. The model had many polygons, and fine detail that resulted in lots of aliasing at low resolution. Since I wanted to use it in interactive applications, I cleaned it up, reduced the polygon count, and updated it for 3DS Max version 4.2. It now has 28,643 polygons, which is still high, but can still be rendered fast on current graphics cards. This is a nice UNC PowerPoint template that was originally made by Wei-Chao Chen for his Dissertation Defense slides. I cleaned it up a bit, and decided to share it for anyone who wants to use it. This is a single class that abstracts pbuffer and render-to-texture usage in a variety of formats. It has support for NVIDIA and ATI GPUs.